Large parts of the country could turn into desert within decades, as many turn to chopping trees as the last remaining resource. But for the livestock keeper, the forests are the last remaining resource. And he is not alone. Hundreds of thousands of Somalia's traditional pastoralist herders do the same, putting their impoverished country on a path of heavy deforestation that risks turning large swathes of their country into a desert. "I used to keep animals, but I lost my herd to famine and disease and am the eldest in the family," says Hussein, 27, adding that he has 10 mouths to feed back home—two children, seven brothers and his mother. Four years ago, Hussein had 25 camels and 300 goats. Now, only three camels and 15 goats from his once respectable sized herd are left. Thus every morning, with an axe slumped over his shoulder, he sets off in search of wood for charcoal. Once he locates and cuts down a tree, it takes two days of burning, and two more days of cooling the smouldering heaps before he can sell the charcoal, at six dollars (five euros) for a 20 kilogramme sack. The village of Jaleo, in the northern self-declared state of Somaliland, once prided itself on being at the heart of the savannah. British explorer Harald Swayne recounted, in his 19th century memoirs, the adventures he had while tracking and hunting "a large herd of elephants." Men carry wood to make charcoal in the village of Jalelo Twenty percent of the forest has disappeared in the last ten years. But the last elephant was killed in 1958, and were Swayne to retake his journey today, he would only find the smallest of game in a rocky landscape dotted with shrubs and charred tree stumps. "Twenty percent of the forest has disappeared in the last ten years—definitely this country is turning into a desert," Ahmed Derie Elmi, director of forests in Somaliland's environment ministry, recently tells AFP. "If the deforestation continues at this pace, this country will be a desert in two or three decades," echoes Ahmed Ibrahim Awale of the Candlelight organisation, which tackles environmental and health issues in Somaliland. Charcoal burning has not always been preferred in Jalelo. Three years ago an outbreak of Rift Valley Fever in the Horn of Africa forced Gulf states to suspend importation of animals or animal products from the region, forcing the herders to look for alternative sources of income. But it is urbanisation and a population explosion that are the biggest threats to the country's environmental well-being. Somaliland's capital Hargeisa has a population of 850,000 people, six times its population in the 1970s, which consumes approximately 250 tonnes of charcoal daily. Elmi says that charcoal is the main source of energy, as electricity is rare and expensive for many. 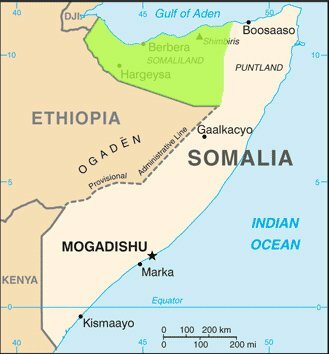 The rampant deforestation is not unique to Somaliland. In southern Somalia, Al Qaeda-linked Shebab insurgents turned charcoal burning and exportation into one of their major sources of income. In a report, the UN monitoring group on Somalia and Eritrea says the Islamist group made up to 25 million dollars every year from charcoal trade. Several regions of southern Somalia were declared famine zones by the United Nations last year, with the deforestation contributing to an extreme drought. In a bid to put an end to rampant deforestation, Somalia's newly elected President Hassan Sheikh Mohamud in one of his first official duties banned all exportation of charcoal, in line with a UN embargo in February. However, much more than a UN declaration and a presidential decree are needed to bring the deforestation to an end. "The underlying causes of poverty and the general decline of the size of livestock herds have to be addressed," says Awale. Alternative sources of energy must be harnessed to cater for the population, massive reforestation campaigns need to be initiated and some of the pastoralists need to switch to agriculture. In a country where the government faces numerous challenges, environmental matters are not a priority. "The Ministry of Environment has the smallest budgetary allocation that only covers the salaries of 187 employees," says Elmi. "All the mature trees have disappeared.... In the past one could get six or seven 25 kilogramme sacks of charcoal from a tree. Today, maybe one or two," Awale says. As a consequence, charcoal prices in Somaliland have doubled in the past four years, to 10 dollars a sack. "Each time I cut down a tree, I am left with a bitter taste in my mouth," Hussein says. "The future is bleak.... All the trees will have disappeared."